Terasic D8M-GPIO is an 8-megapixel camera kit with a 2x20 pin GPIO connector interface. It includes a MIPI camera module and a MIPI decoder. The MIPI camera module captures images and sends them out in a MIPI video signal package. This packet is converted into a 10-bit parallel Bayer pattern through a MIPI decoder. The data is transmitted through a 2x20 pin GPIO connector. The MIPI camera module has a built-in Voice Coil Motor (VCM) to control its focal length. Users can adjust the focus via the I2C interface. The 2x20 pin GPIO connector is the standard expansion interface widely used on Altera DE series development kits. Any main boards with a GPIO connector can interface with D8M-GPIO. 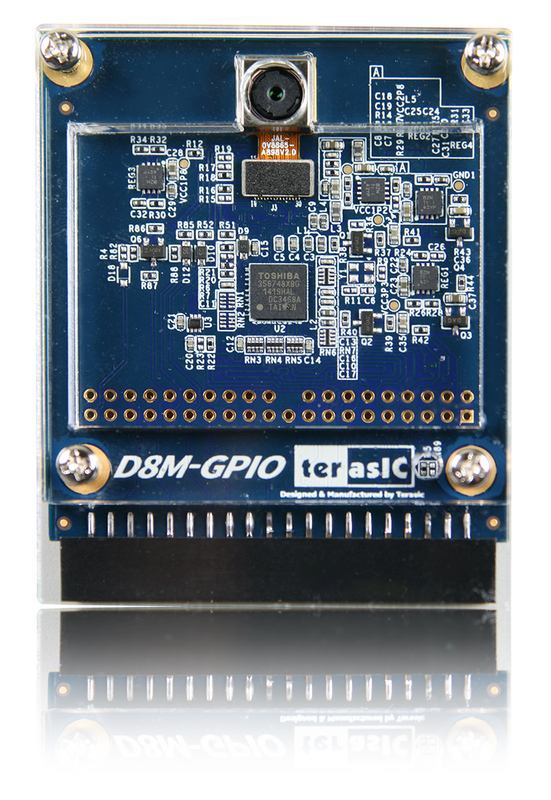 Terasic D8M-GPIO kit also includes camera capture and display reference design. It comes in two versions. One is only RTL code and the other one uses components such as Altera VIP in Qsys. It enables users to rapidly be familiar with the operation of the camera module and develop custom applications based on these examples as a reference.